FootJoy has been in the golf business for decades and in the shoe business for hundreds of years. The company originated as Burt and Packard Shoe Company back in 1857. This company shortly became Field and Flint, through which the first pair of FootJoy golf shoes was manufactured. Their popularity rose quickly once legendary golfer Walter Hagen and his team made FootJoys their official shoes during the 1927 American Ryder Cup. It took about 40 more years for Field & Flint to change their name again, this time officially to FootJoy. This long-standing traditional golf manufacturer is actually owned by the Acushnet Company, which also headquarters two other popular and respected golf brands: Titleist and Cobra. 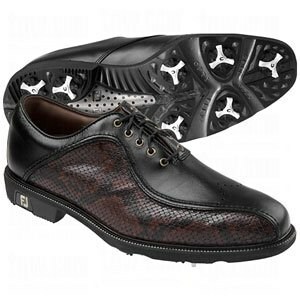 Even though FootJoy isn’t limited to just shoes, these shoes are what the company is best known for. Models such as DryJoys, Icon, GreenJoys, and Syner-G are among FootJoy’s best-sellers. Shoes come in spiked or spike-less varieties, are suited for all weather conditions, and prize comfort over all else. They can also be custom-ordered with special colors and patterns through the MyJoys online customization tool. The Icon line is all about traditional, classy looks, made with full-grain leather that also boasts a 2-year waterproof warranty. DryJoys target golfers that favor comfort over a luxurious appearance, although the shoe’s soft Pittards leather, cushioned insole, and fully waterproof exterior beg to differ. And the Syner-G shoe puts these common features into a stable, ultra-supported sports fit, complete with Stinger cleats. One small drawback about these FootJoy shoes is that they may not last as long as other brands of shoes, given that the leather is so soft already. If taken care of properly, the shoes should last for quite a while, but for those who like to play rough, it’d be best to break in a pair of more durable shoes, like these ones from Adidas. FootJoy also makes a few of these models in women’s sizes: DryJoys, GreenJoys, the LoPro collection, and the Summer series. GreenJoys are the company’s “entry-level” shoe. These are less expensive and are made from water-resistant PVC instead of real leather to save on cost, but the insoles are still just as comfortably cushioned. Lady golfers looking for the classy equivalent of the men’s Icon line will find what they are looking for in the LoPro collection. And the Summer line is the sportiest of the bunch, melding features of a walking sneaker into a waterproof white leather golf shoe. FJ Summer shoes also come with the #1 best-selling cleats on the market, Pulsar by Softspikes. 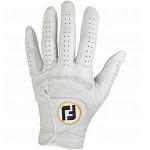 The lineup of shoes is impressive, but FootJoy is also well-known for making extremely soft leather golf gloves as well, like the StaSof gloves. These are made from soft cabretta white leather from Pittards of England and are similar to a wearing a super-soft pair of driving gloves. StaSof gloves got a modern technological makeover in 2004, and since then, they’ve been the best-selling cabretta leather golf glove in the world.